Cruisair Dometic Available in 16,000 to 24,000 BTU. By buying this product you can collect up to 567 Yachtaid Points. Your cart will total 567 points that will be converted into a voucher towards your next purchase! Must be logged in to collect points. Marine Air Conditioning Cruisair Dometic Available in 16,000 to 24,000 BTU. Marine Air’s Chiller Compact series is ideal for larger boats in the 45-70 ft. (15-20 m) range. Available in capacities ranging from 16,000 to 24,000 BTU/hr, the Chiller Compact uses circulated water in a closed loop in place of copper refrigerant tubes. The innovative, space-saving compact base of the Chiller Compact was designed to allow individual modules to be multiplexed to provide precise capacity requirements for any application. Featuring high-efficiency components that offer maximum performance, the Chiller Compact uses rotary or scroll compressors which are quieter and consume less power. A custom-fabricated condenser coil is constructed of spiral-fluted cupronickel to provide maximum heat transfer and high corrosion resistance. The environmentally friendly, hermetically-sealed Chiller Compact units use closed-refrigerant circuits, pre-charged with refrigerant. No additional refrigerant is required during the installation or at initial start-up and operation of the system. The Chiller Compact series is ideal for larger boats in the 45-70 ft. (15-20 m) range. 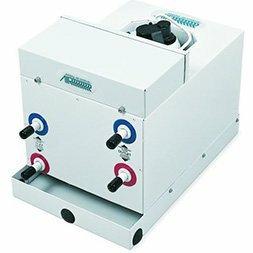 Available in capacities ranging from 16,000 to 24,000 BTU/hr, the Chiller Compact uses circulated water in a closed loop in place of copper refrigerant tubes. The innovative, space-saving compact base of the Chiller Compact was designed to allow individual modules to be multiplexed to provide precise capacity requirements for any application. The CHCG compact series of modular chillers is ideal for large ships (15-20m). Available in sizes of 16,000 and 20,000BTU.CHCG uses circulated water in a closed loop instead of copper pipes. The innovative, compact CHCG is designed to enable different individual modules to be Compile and deliver the exact capacity for different applications. The new CHCG series is designed to maximize the impressive characteristics of the R-410A, a proven and environmentally friendly cooling medium. The CHCG chillers come with the same dimensions as the older CHC model with all the connections in the same positions, making it an ideal replacement for the older model. Using high-performance components to provide maximum efficiency, compact chillers come with hermetically sealed compressors and factory-fitted condenser tubes constructed of a coupon for maximum heat transfer and high corrosion resistance. A better sensor position allows better sensing response. This provides the safest, most efficient and fast response control while at the same time providing enough space for all water connections to be secured with double clamps. Another innovation is that there is no foam inside the unit which makes it easier to service, and the performance and efficiency is equal to or better than the older CHC model. Optional SmartStart can be included to reduce the start current of the compressor. The electric box comes mounted on the top of the unit, but short wiring allows it to simply move to the end of the unit if desired.